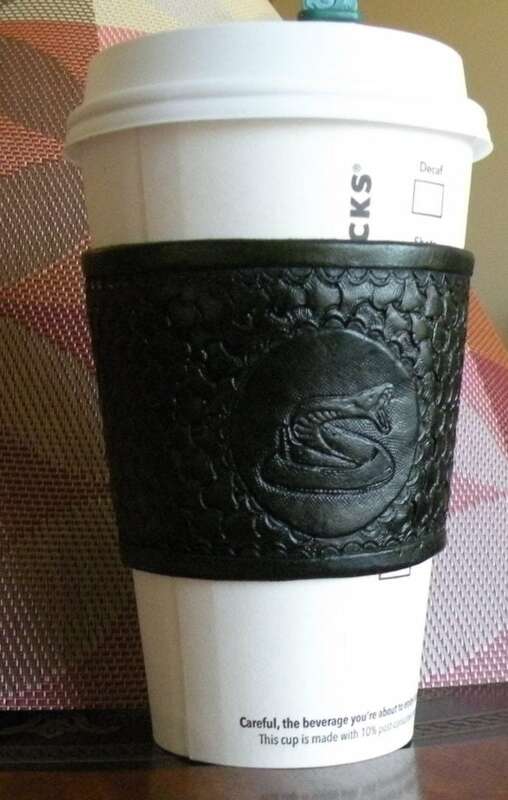 Key Chains, Wristbands, Barrettes, Coffee Sleeves, etc. This page highlights a number of smaller items that can make great gifts and are easy to carry and personalize. 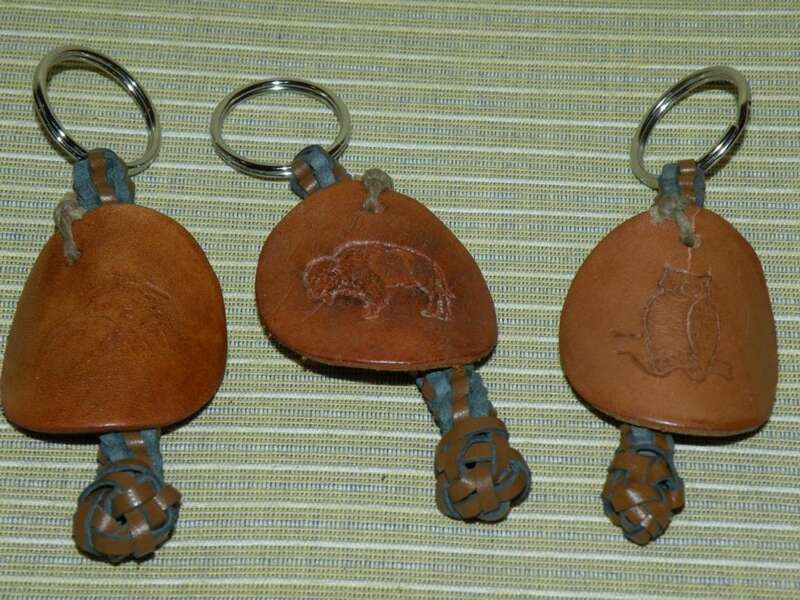 Key chains can be simple leather fobs or disks, or braided or both combined. Long hair? 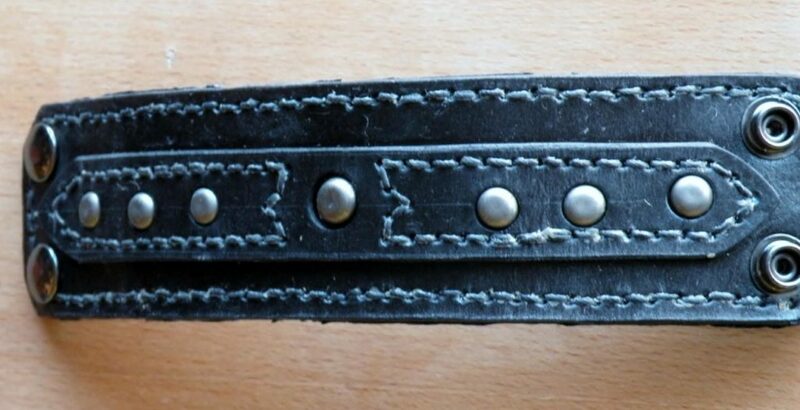 Keep it under control with a leather Barrette , decorated to show your style. Wristbands in the color of your choice with names or designs delight kids. Watchbands are another relatively inexpensive option. 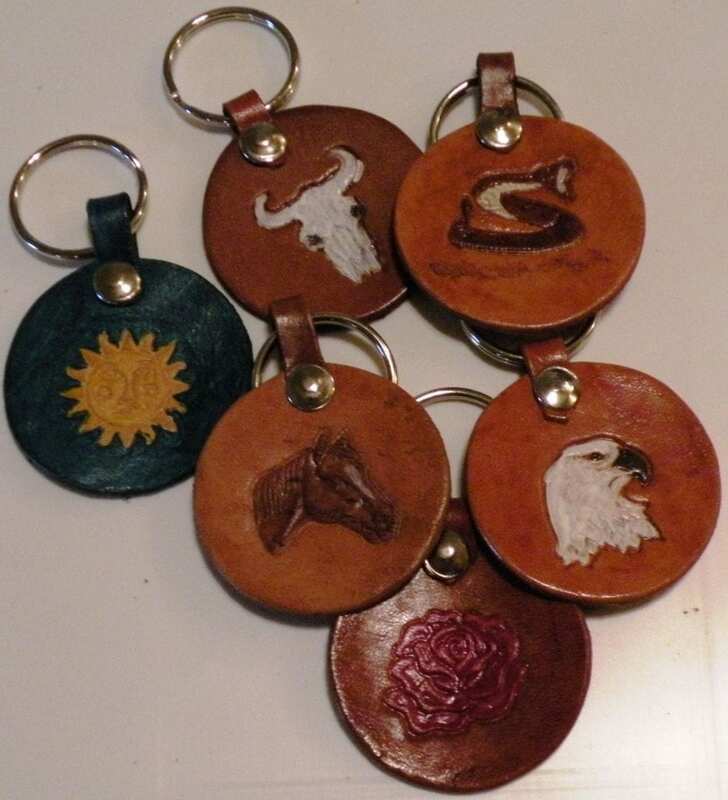 Basic key chains or braided handles or anything in between. Want your initials rather than a picture? Not a problem! Can also do single piece key fobs where a single piece of leather carries the pattern and hooks through the key ring. 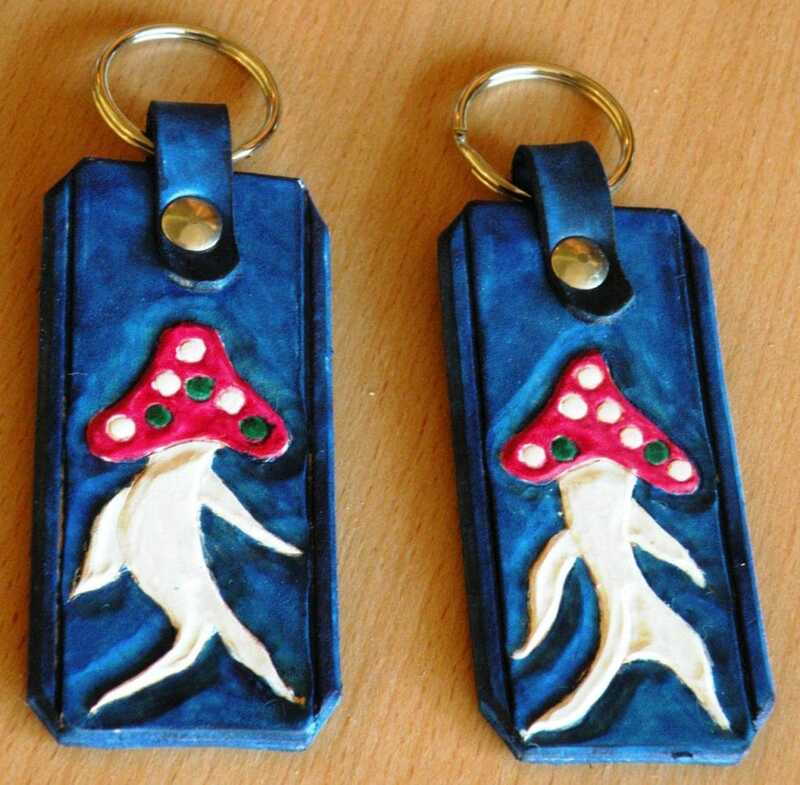 And just to prove that size, shape and theme are not obstacles, we have the attack of the mushroom people! I call these two “Strutter” and “Strider”. Rather than throw away used bicycle parts, why not recycle them and use them! 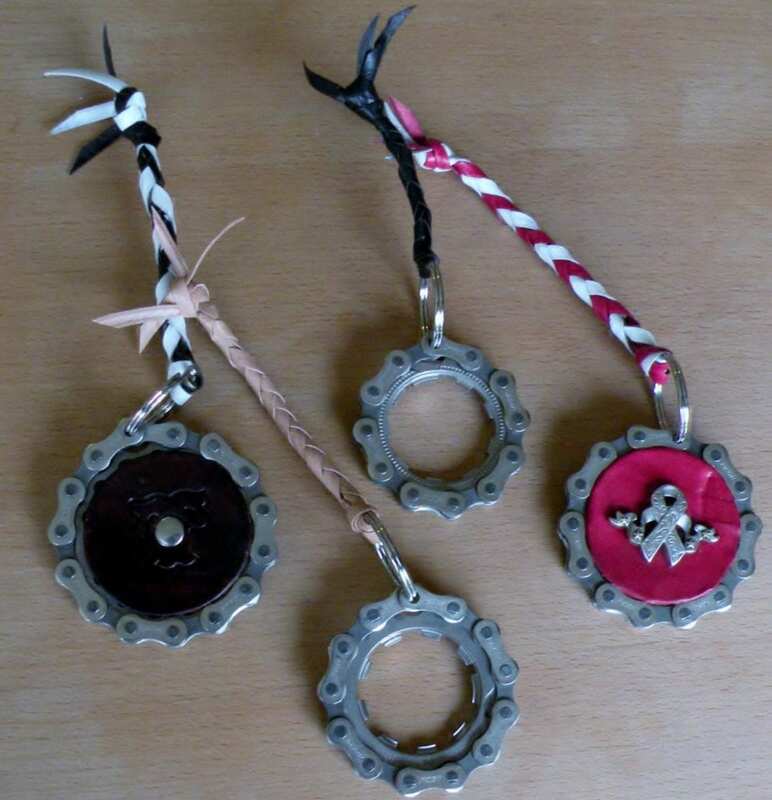 That’s the spirit behind these keychains made from rear cogs from bicycles and pieces of chain….and of course leather! 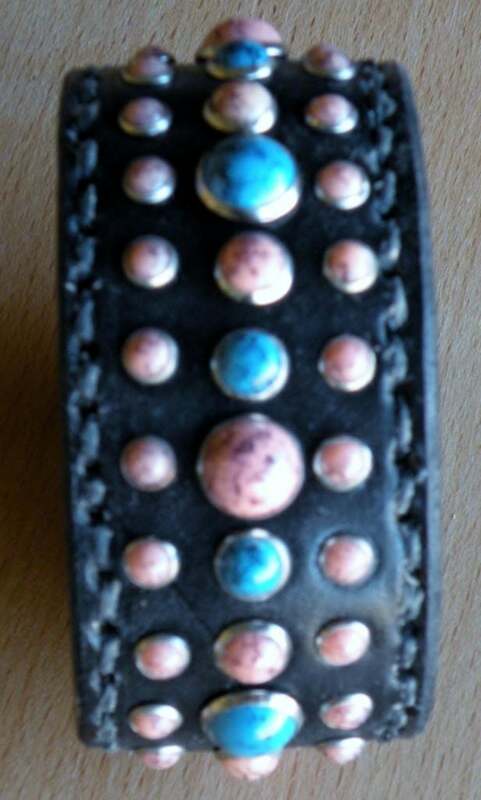 Different conchos and colors can be added to achieve different looks. 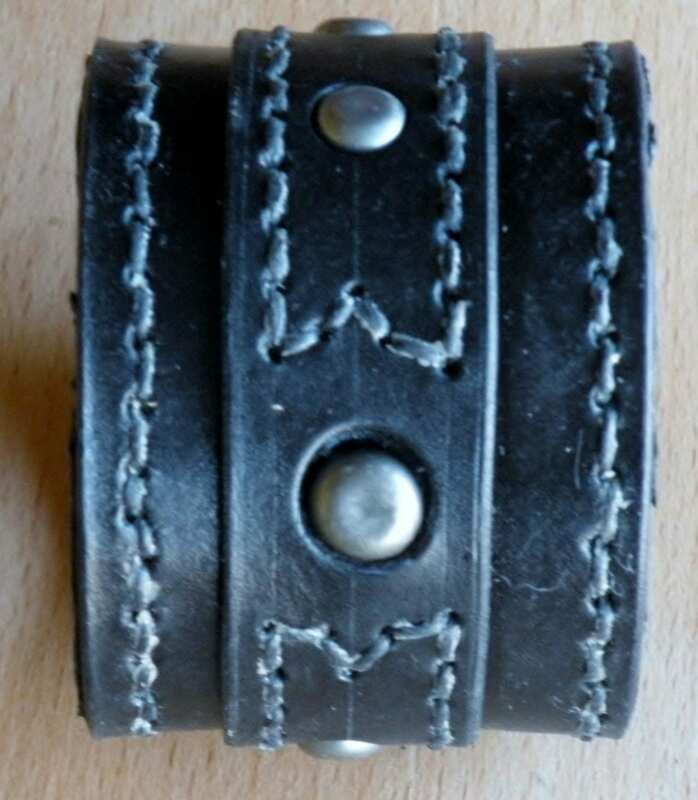 Leather cuffs for women and men. Your choice of size, style and colors. Plain leather, crystals, studs, stones, you tell me what you want and I’ll do it for you. Here are a couple of examples…. 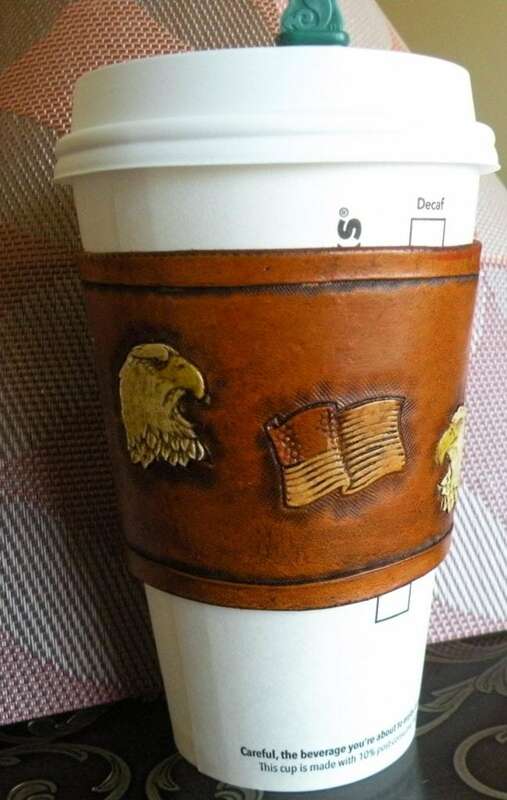 Why use those paper/cardboard sleeves when you can have a custom leather sleeve. Here are a few ideas for designs! Use a wrist cuff to honor friends, loved ones or comrades. This one uses a metal plate to record the information. 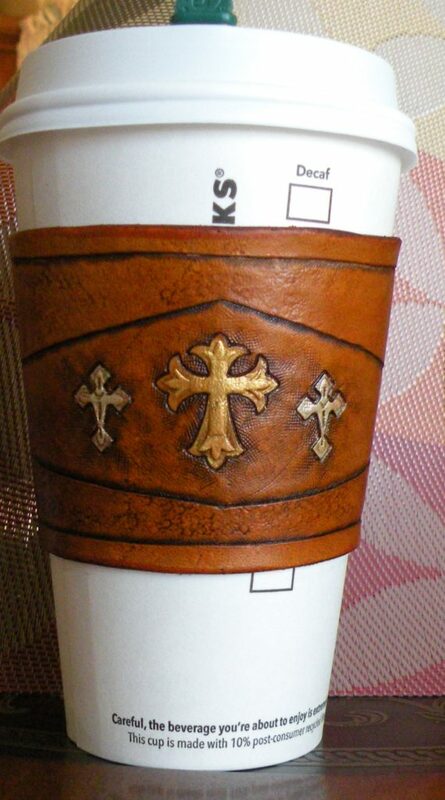 Alternatives are laser engraving on the leather or tooling of the leather. Get the idea? Essentially anything is possible. 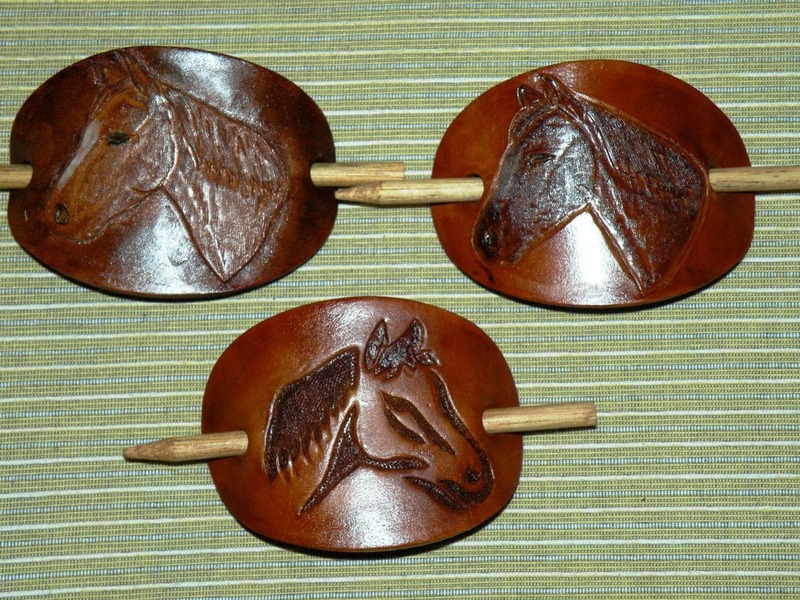 The three horse’s heads above illustrate three different types of tooling. Top left is normal raised tooling. Top right is inverted tooling. Bottom is stenciling. As shown below, color is a definite possibility! America’s summer past-time, Baseball. 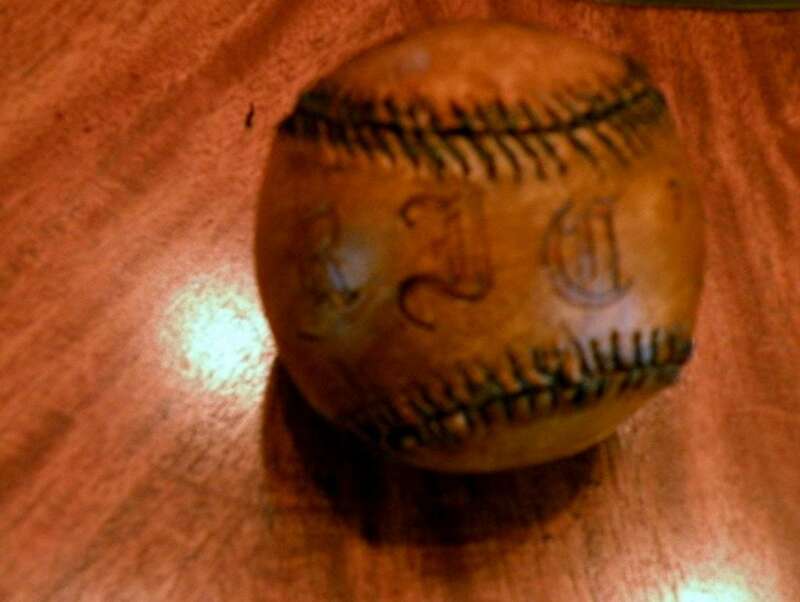 What do you get wihen you skin a baseball and install a custom leather cover? Something neat! 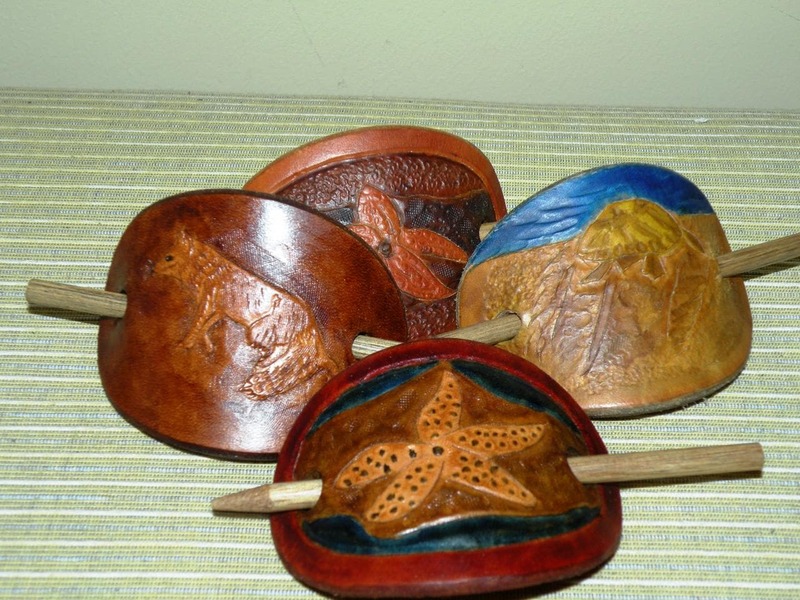 Great idea for gifts, promotional items, or just a cool thing for a desk!